Many people that I talk to imagine that being a wedding photographer, particularly in the paradise of Costa Rica, is a piece of cake…arrive just before the ceremony, take photos, try and stay invisible…easy huh? Well this is just not the case at all! Like every part of a wedding day, whether you are the bride, the groom, the wedding planner or the caterer, everything looks easy, but believe me…a lot of work has gone into making it look easy! As the wedding photographer, I am normally in contact with the bride and groom months before they arrive in Costa Rica for their wedding, finding out about them and what sort of photographs they would like, answering questions about the local area, where to get the best photographs, generally planning for the best way to capture their wedding day. As a photographer, there are certain very important rituals that I run through before the day and on the morning of the wedding…I need to check that all my cameras are working, batteries are fully charged, lenses are clean, check back up cameras, tripods, reflectors, flashes, check the back ups back up camera and take time to clear my head and give my self fully to the wedding…etc. Then the wedding day begins….I typically take photos before the wedding of some of the preparations, like the bride finishing getting ready or having a pre-ceremony glass of champagne with her brides maids, or the groom nervously joking with the best man, these are the moments that begin to reveal the story of the day. During the ceremony I do my best to be invisible, whilst photographing the wedding from a variety of different angles that capture the eyes, the curve of a smile, or body language of two people brimming with emotion and love. 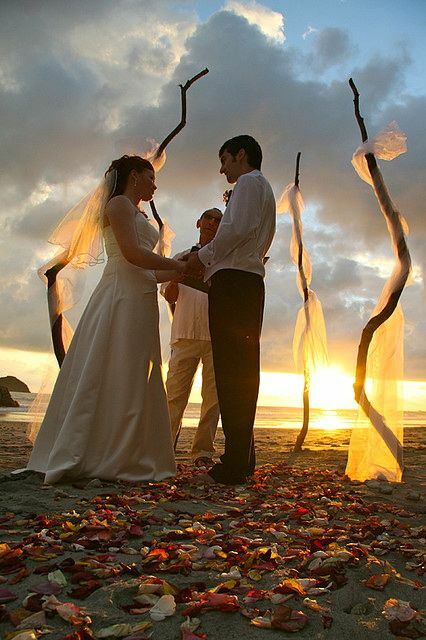 Many people chose to get married on the beach in Costa Rica, which gives a stunning back drop and the amazing sunsets on the Pacific coast cast a magical light on the photos! After the ceremony I normally take many photographs of the bride and groom and also group and family photos, I try and make them a bit fun and inventive by using the natural surrounding like the beach, palm trees, the waters edge, even monkeys from time to time. My idea is that we all have fun with the photographs and in that way it is more enjoyable for everyone and as people relax their natural personalities and smiles come out. After the ceremony I often photograph the reception, and get details of the cake, flowers and toasts. For larger weddings, I really enjoy when I am able to stay for the whole evening (till the music stops) and fully capture the whole day. This allows me to get to know everyone better and be part of the celebration when people are relaxed and reveling in the after glow of the day. Also, for better or for worse it really is fun to see all those crazy dance moves and wackiness going on late night and know friends and family will be enjoying those photos for years. Often the bride and groom like to take more photos a couple days later, once the pressure is off and guests are not waiting to get stuck in to the champagne or cocktails. Then we can spend an hour or two getting some beautiful photographs either on the beach or with a sunset view. Then the editing work begins, I post some of the best photos to my image gallery with in a week so that the couple can share the memories with all of those anxious friends and family who want to relive the day or were not there to participate. After that, I spend time editing the rest of the photos, which for each hour on site normally means 3-4 hours of editing. When I have finished editing and correcting the photographs, I send a high resolution DVDs of the wedding photographs to the bride and groom as soon as possible so they can print and share their photographs of their tropical wedding in Costa Rica with all their friends and family back home. I always include a DVD slide show set to music, that reads like a book of the visual moments and progressions that make up the Bride and Groom’s story, this really does tug on some heart strings and brings you through the emotions of the day that go so quickly. That is what I enjoy most, knowing that I have documented and been part of one of the most amazing days of people’s lives and given them something that will bring them back the instant they look at the photo and read into the smile or details within. So as you can see the wedding day is not just one day at all! This entry was posted in Life in Costa Rica, Manuel Antonio, Costa Rica, Wedding Photography and tagged beach wedding, costa rica, destination wedding, manuel antonio, quepos, wedding, wedding photographer, wedding photography. Bookmark the permalink.